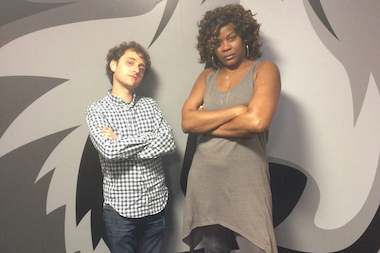 Ben Larrison and Sheryl Swoopes will face off in the Dunk Contest of the Century of the World. The contest pits 5-foot-5 Larrison against 6-foot Swoopes in a dunking contest on a Fisher-Price children's basketball hoop. CHICAGO — This might be the only shot a 5-foot-5 comedian has of taking down former WNBA star Sheryl Swoopes on the court: a dunking contest on a 6-foot (at most) children's hoop. Ben Larrison, 27, of Lakeview, will face 6-foot Swoopes in The Dunk Contest of the Century of the World using a Fisher-Price children's basketball hoop that can be adjusted to be 3 to 6 feet tall. A standard basketball hoop stands 10 feet from the floor. The contest will be held at 8 p.m. Wednesday at Comedy Sportz, with tickets available online. The two will perform in five rounds using trick dunks they've developed secretly, with the event structured like an NBA dunk contest. 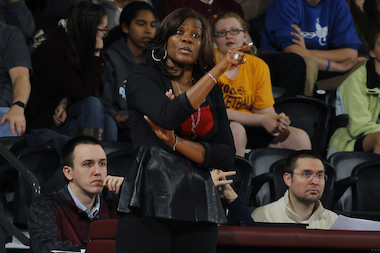 Larrison will also talk to Swoopes, now the head women's basketball coach at Loyola, about her life and career. Sheryl Swoopes, former WNBA star and current Loyola University head women's basketball coach, will face off against 5-foot-5 comedian Ben Larrison in a dunking competition Wednesday. "All I can really say is [the] thing I'm working on is very much inspired by Blake Griffin dunking over a car. ... I think she's got a couple things she's been developing," Larrison said. "If I overthought this, I think I would have had second thoughts about how ridiculous a thing it is and how unlikely it is to happen." Swoopes, who has not participated in a dunk contest before, said she hasn't practiced for the competition. She doesn't plan on jumping over anything or wearing a blindfold. "I'm not trying to hurt myself," she said. "I'll try to do something that will help my chances at winning." Larrison used a Kickstarter campaign to fund the event — paying for the hoop, tickets, venue and more — before reaching out to Swoopes, who took him up on the competition. They worked together to flesh out the contest. Through his Kickstarter, Larrison noted the average American man is 5 feet, 9 inches tall — or 4 inches taller than he is — which spurred his decision to create the competition. "So what am I to do?" he wrote on the campaign page. "Just stand on the ground, like some sort of idiot? Or fly through the air, like a magnificent bird with hands/clothes?" And for a guy who grew up in Connecticut watching women's basketball, competing alongside Swoopes is a dream come true. She has three Olympic gold medals, is a three-time WNBA MVP, averaged 15 points per game and netted 4,875 points total during her professional career and is considered one of the top WNBA players of all time. She was also the first female player to get her own signature Nike shoes, dubbed Air Swoopes. In comparison, Larrison has not played organized basketball, focusing his talents on comedy as a member of the Ghost Car improv team at the Playground Theatre and a member of Improvised Double Dare at Comedy Sportz. He also writes plays and acts. Still, the comedian thinks he has a shot at winning. "For her I think it will not be as big of a challenge," Larrison said. "From day one she was always at the top of my list of people I'd love to [face]. ... Somehow I managed to have my opponent be one of the greatest players of all time. ... She's a legend. She's one of the most accomplished athletes of the last 50 years." Swoopes thinks her lack of recent playing time and Larrison's small size may be an advantage when it comes to dunking on the Fisher-Price hoop. "I have not touched a basketball in over a year, haven't played in a few years, haven't practiced, haven't done anything," Swoopes said. "Now, if we had a shooting contest or something like that, I'd say he doesn't have a chance." General admission is $5, and tickets can be bought by calling Comedy Sportz at 773-549-8080.